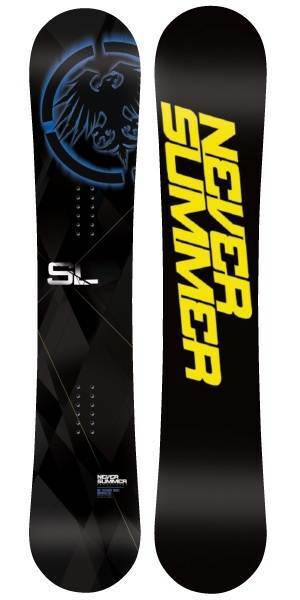 The 2015 Never Summer SL is now only available in split. The solid models have become Snowtrooper. This review is based on the Solid and not the Split. 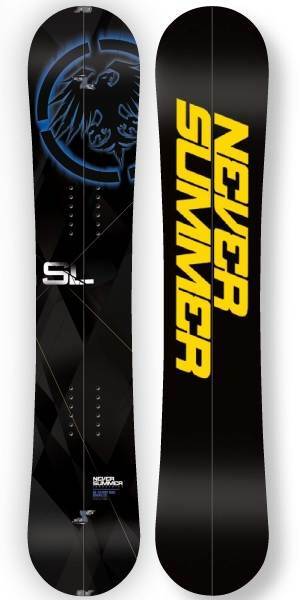 The Never Summer SL is one of their most popular boards and for good reason – it makes snowboarding easier for the average all mountain rider. Never Summer has made a big leap the last few years from a cultish small Colorado following to a more main stream line. Now people are asking about this board overseas and we understand why. Conditions: Everthing from 1-3 feet of thick west coast powder to hard/borderline icy snow. 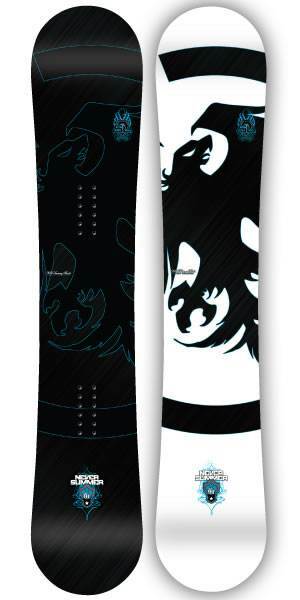 Bindings Used- Burton- Cartel Re:Flex, Burton Diode, Burton C02, Burton C60, Burton P1, Union Force, Union SL, Union Atlas, Flux TT30 and Flux SF 45. Boots: Burton SLX, Burton Ion, Burton Imperial, Nike Kaiju, Nike Zoom Ites and a few others. The 2010 to 2014 Never Summer SL hasn’t really changed that much except for some minor tweaks here and there. The consistent theme is the board seems to get a little bit more stable between the feet every year. Now, more than just Colorado riders are beginning to understand the well built reliability that Never Summer offers. The Never Summer SL-R is a great choice for a hybrid rocker all mountain board and one of our favorites. We took this twinish shaped board in powder, groomers, trees, the park and steeps. On Snow feel: The SL has a great cruising the groomer kind of personality. Like most Never Summer boards it offers up a pretty stable ride on softer snow but becomes a little loose between the feet riding in harder snow. It’s twinish shape with a set back stance offers a pretty diverse ride but it’s more at home on the mountain. You can pick up speed, hit the trees on a powder day, slow down and butter or lay out some moderate carving turns. Turn Initiation and Carving: The SL is easy edge to edge and provides no challenge for riders of any levels. You can turn pretty quick edge to edge and wider radius turns aren’t that bad. When it comes to a carve it’s missing something and it can be a little washy. It’s fine for making a skidded turn but that’s just fine for riders who haven’t perfected how to turn well. Powder: There are only a few powder days in a season, so it can be hard to test all boards in these conditions, but we had some deep days with this one. The float is effortless and easy for a board of it’s shape and size. It’s a very fun directional ride and the board doesn’t want to sink unless you really try. We like the Cobra a little better in powder but both are great. Speed: The SL can handle speed rather well for a mid flexing hybrid rocker board. It has some kind of dampening system that provides a nice insulation from high speed chatter below even though the nose and tail can flop a bit. It’s got a good base as well that keeps its speed in the flats. Uneven Terrain: This mid flexing board handles uneven crappy terrain like a champ. It feels smooth underfoot and makes the end of the day chopped up snow very bearable. You can handle bumps of all sizes at slower speeds rather well with the SL. It almost has a rubbery type feel that feels like the board is very shock absorbent. Approximate Weight: The Never Summer SL-R is on the heavy side however a 3 year warranty is worth a little extra pressure on your leg when riding the chair. Edge Hold: It wouldn’t be ideal for icy conditions but will do well in most conditions people want to ride in. It never gets over grippy and provides pretty good grip in all conditions. Flex: More stiff than your average all mountain board here and it’s still playful when it comes time to butter or press around. Switch: This is a twinish board but not a twin. The contact of the nose and tail is minimal and that helps the SL ride better switch than a cambered version. There is still a difference between regular and switch but you get used to it over time. Jibbing: It’s not bad but the Evo wins here hands down. You can stop in to play in the jib park. It’s not for the ultra technical rail but it’s fun to hit a box or bonk. Pipe: This is a good pipe board that is very forgiving. It’s not going to have that drive wall to wall for the expert pipe rider but the average rider will like this in the pipe. Jumps: Lately we have liked the snap of the carbonium top sheets in Never Summers line but this isn’t bad. The spring is a little more slow and it doesn’t load up as well as the carbonuim top sheet models like the Cobra but it does an above average when creating your own air. It’s not bad in the park and can handle kickers of all sizes. It’s not that hard to swing. We try to get as many images of the Never Summer SL, but forgive us if they're not all there. Took the first two hours in the morning while the wife watched the baby. Riding solo, I just full throttled pretty much every run to scout which runs had the best snow for the wife. The best part about best part about snowboarding is going fast and carving. The edge hold just builds confidence. 2ft of snow over night. So much fun. Navigating through the bumps and popping off them. The float was pretty good and my back leg wasn't burning. I didn't set my bindings back so I had to put a bit more weight towards the back. Weekly leg exercises helped also. They discontinued the SL and added the trooper? Looks like the same board with that extended profile. Better float? At the end this will be my go to board for a trip with mixed abilities. You can cruise or push it. If you have a chance to demo boards, please do so before buying one. Seriously. This is the bomb. The rest of the day was sick. I could turn on ice. I could turn on hard pack - I could fly off the little lips and kickers. I stomped the landings. I could point the board and just fly. And a 153 is too small for me. I was sold. I spent the next few weeks daydreaming of the board - before I bought a 155. And now I can charge anything. The board holds a serious edge, sometimes too well! I love this board, and may never ride anything else. I've been riding a 2011 SL with Flux SE30 bindings for two full seasons now. I also have a 2011 Premier F1 (SF45). I split my time between the two boards for a long time, but recently the SL has become my go-to. It's a very very solid all-round board. Yesterday I started out with three runs through fresh pow on an open face, lapped a long mixed-terrain run for a while, then spent most of the rest of the day in tree runs of varying tightness, reached/exited along traverse paths and busy, chopped-up groomed trails (where I usually mess around with jumps and spins and switch riding). The SL handles all of those with ease. It's stiff enough to carve open groomers and hold an edge on steep pitches, it rides well in pow if you keep your speed up (well enough that I don't really miss the F1, which is theoretically a better pow board), yet it's flexy, manoeuvrable and lightweight enough to be fantastic in trees. I love the feeling of sending the SL down a moderately gladed face, or negotiating some tight trees, and it's an amazing board for hitting natural features. The F1 is kind of a drag in comparison - it's heavy and too stiff to throw around the way you need to. The SL is not quite a true twin, but it rides switch fine, if you keep the stance close to centred. I don't hit the park that often, but the board can certainly handle it; it's stiffer and heavier than a true park board, but good enough to do the job for an all-rounder. If you're looking for an all-around board for resort riding, the SL should definitely be on the demo list, I've been completely happy with it. I second Greg on NS as a company - I haven't needed any customer service, exactly, but I wrote to thank them for the board and they mailed me some stickers and a nice letter, so they're cool people. By all accounts their boards are built like tanks, mine is still in great shape after two years and quite a few exposed roots. As goodride and Greg note, the SL has not changed much at all in the last few years, so if you see an older model on discount, go for it - it'll be pretty much just as good as the current year. This board does't get the same level of hype that others do. Maybe because NS figured the formula out on the SL a few years ago and hasn't needed to make any "hyped" changes (e.g. RC profile adjustments, asymmetrical flex, or flex change to twin, etc...). This deck just works. I realize it even more after I ride other boards. I am impressed with the edge hold, pop, and durability. Good stability at speed and easy to turn with just the right amount of dampening. I really don't think you can find a better all mountain board in this price range. You can find similar but not really better. NS customer service is great and this is Made in the USA - Big +!